You only have three free days and you do not know what to do in 72 hours in Deltebre? Do not worry! Just because you have limited vacation time does not mean you cannot see and do many things. Therefore, we have created a 72-hour travel itinerary with some of the greatest experiences you must live if you visit us. As you may already know, Deltebre is in the heart of the Ebro Delta Natural Park. The first thing you will notice about this place is its landscape: there are no hills here. This wetland is a 320 square metre flat surface with an almost perfectly straight line in the horizon. Therefore, bicycles are a handy and traditional means of transport in these lands. You will see very different landscapes depending on the season you come. This is due to the rice cycle, which characterises the colours of the landscapes. You will see blue scenes if you come in spring; green views if you come in summer; yellow landscapes if you come at the end of the summer, and brown scenes if you come in winter. You should also know that the people here have an attractive personality. You will find very welcoming great people who will make you feel at home. Finally, we would also want you to know that we are a sustainable tourism destination (which is another way to say that we are eco-friendly). We are confident that your help will let us conserve this natural heritage. So please, always follow the directions and recommendations. If you find out more about our history, the Ebro Delta and Terres de l’Ebre, you will come fully prepared to live this amazing experience. We will start our day visiting the Ecomuseum – Ebro Delta Natural Park Information Centre. There we will get more information about the Ebro Delta, its origins, history, architecture, festivals and traditions, etc. This place is perfect to get the maps and tour guides we will need. In the Ecomuseum they will inform us on how to get to the best places to visit. A bicycle route will be a good idea to help you relax while you do some sport and enjoy the landscape. In addition, bike rental companies can take the bicycles to the starting point you wish. 2 p.m.: Prepare your taste buds. It is time for lunch! After the bike ride, it will be the perfect time to savour the local cuisine at any of the restaurants in Deltebre. You can choose according to the type of food you want to taste: rice from the area, traditional recipes, tapas & sandwiches, cuisines of the world… You can also choose a restaurant depending on how hungry you are. We can eat near the mouth of the river, in Riumar or we can go back to the centre of Deltebre. After exploring the river, it is time to go shopping! In Deltebre you will find everything you need: clothing shops, shoe shops, supermarkets, farm shops, etc. Shopping in Deltebre has a special charm thanks to the commercial hub, which includes a wide variety of shops, weekly markets and the personal treatment. After going shopping, we can cool off in one of the many beach bars there are in Riumar and Deltebre. You can drink something while watching the sea or the river, depending on the beach bar you go to. In summer, it is still a good time for the last dip of the day. Are you hungry? Now it is a good moment to do go dinner. Tip: before choosing the restaurant, take a look at the agenda of Deltebre, because you may find amazing night activities such as live opera on the beach or performing arts performances. And do not worry about where to sleep! In Deltebre there is wide range of accommodation. Opening hours: from Monday to Sunday from 10 a.m. to 1 p.m. Winter afternoon: from 3 to 5 p.m. Summer afternoon: from 3 to 6 p.m.
Summer opening hours (3rd July – 30th September): from Tuesday to Sunday from 10 a.m. to 2 p.m. Tuesday, Wednesday and Thursday from 4 to 7:30 p.m. Friday and Saturday: from 4 to 8 p.m. Check all the tourist services in Deltebre to better plan your experience. A good day starts with a good breakfast! Today we will not spend time blocking our schedule because the idea is to enjoy a relaxing day tour. The first thing we will do is having a good breakfast to provide us with energy. We can go to one of the many coffee shops in Deltebre or in Riumar. Breakfast will be the perfect excuse to taste some local traditional sweets with a tasty coffee. We will start with one of the most relaxing experiences we can live in the Ebro Delta. We will go directly to visit one of the most significant spots in these lands: Punta del Fangar. There we will see ‘La Faroleta’ that is the local name for the Fangar Lighthouse. As a curious fact, there we will walk through the only desert in Catalonia. This place has been a film location in famous productions such as Sahara, U2 music videos and local music band videos as well. As it is a desert, it is highly recommended that you bring water and sun protection. If the weather is right, you can take the chance to swim in one of the most beautiful beaches in the Mediterranean. Anguila en suc (eel in sauce); arrossejat (rice with fish served separately); arròs, col i fesols (rice, cabbage and haricot beans); frog legs; mussels and oysters; duck from the Ebro Delta… There are so many options that you will not know what to choose. But do not worry because whichever option you choose it will be amazing! According to the season, remember to book a table before. 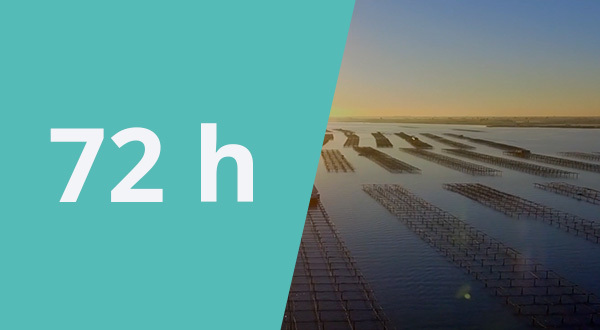 And if you want to experience a unique gastronomic adventure in the Ebro Delta you should go to the mussel beds where you can taste fresh mussels and oysters. Visiting the mouth of the river is a must do activity when visiting the Ebro Delta. One of the most beautiful ways to visit this place is by boat. Another amazing option is to take a walk along El Garxal route until you reach the mouth of the river and the islands of Buda and Sant Antoni. This will be a time to fill yourself with positive energy. If it is summer, remember that from this time on you should take with you mosquito repellent! Plan B if you already knew this place: take a stroll along the Ebro path, cross Lo Passador bridge and go to the Molí dels Mirons viewpoint, which is one of the best places to watch the setting sun, especially in winter. Before choosing a restaurant, check out the agenda of Deltebre, because you may find amazing night activities such as live opera on the beach or performing arts performances. Good morning! Let’s have breakfast! We will have breakfast because we need energy for our day tour today. We can have breakfast in Deltebre or in Riumar. How about fresh coffee aroma, a delicious orange juice, some toasts and a tasty pastisset (sweet pumpkin pastry)? That sounds great! When coming to the Ebro Delta, there are special places you cannot leave without visiting. That is why today we will visit the Souhtern hemidelta. The easiest way to visit this area is to cross Lo Passador bridge. This tour includes several stops: Sant Jaume d’Enveja, Migjorn viewpoint (amazing panoramic views of the island of Buda, Migjorn River, l’Aufacada and the Mediterranean), la Tancada (a great place to see flamingos), Trabucador beach (in Punta de la Banya), MónNatura Delta de l’Ebre (here we will learn about the salt, traditional fishing and the birds of the Ebro Delta) and Poblenou del Delta (here you can eat mouth-watering rice-dishes). Did you have a nice lunchtime? Now is the time to continue with our tour. We have different options according to your time. We can visit the Rice Museum Molí de Rafelet that has the only wooden mill still in operation in the Ebro Delta. We will end the tour with a relaxing walk along the riverbank. We will cross Lo Passador bridge and we will walk until we reach the Molí dels Mirons viewpoint to watch the setting sun.